Johannes Praetorius and Franciscus Romanus Bruno (respondent). Disputatio historico-physica, de Crotalistria tepidi temporis hospita ([Leipzig], 1702). First published in 1656, this is a treatise with a ponderous learned apparatus on the flights of migratory birds. 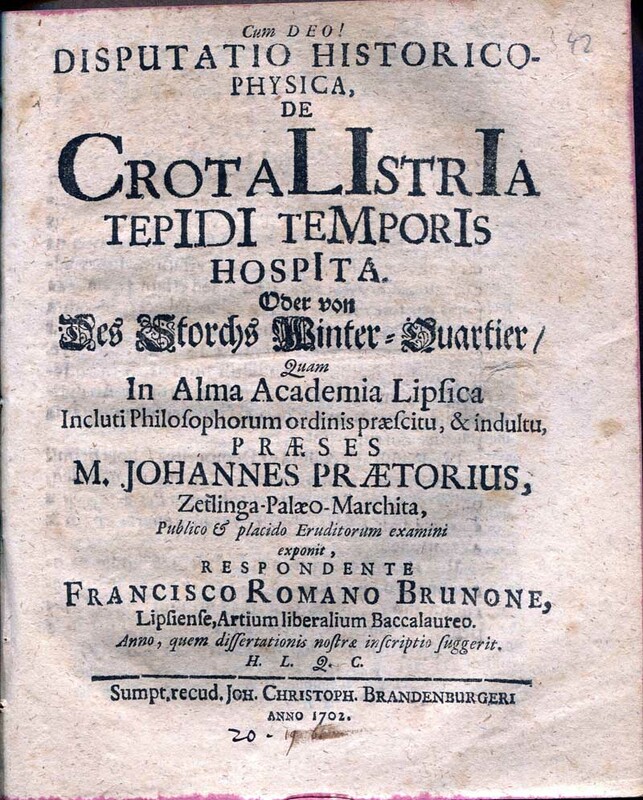 Johannes Praetorius, according to one authority, “had an open eye and a sharp ear for all wonder stories, witch tales, and accounts of ghosts and sorcery current among the people. He indefatigably collected all information on remarkable subjects and happenings, and was fond of popular gossip, even of the uncouth type.” The author makes an exhaustive search of classical to modern literature that deals with the migratory behavior of birds, extensively footnoted, with observations of bird flights from the Nile to Nova Zembla (among others). “In a recent address before the Albany Historical Society, Lawson Purdy, ’84, president of the New York City Commission of Taxes and Assessments, made a strong plea for the abolition of the personal tax. Mr Purdy has made a special study of taxation for many years and is considered an expert on the subject. He argues that because personal property cannot be taxed equitably and by the same method as real estate, the tax on it should be removed. He has advocated several bills before the legislature which would wipe out all such taxes. Mr. Purdy claims further that special taxes have withdrawn certain forms of personal property from general taxation. He offers the following remedies: In that assessors are hampered by the fact that no deeds contain the true consideration for the conveyance of real estate unless they are made by executors and trustees, the law should provide that the true consideration for the transfer of real estate should be stated. He argues that assessors should be appointed and not elected. The men who do the actual work should be appointed under civil service rules, which would protect them from dismissal except for cause. Mr. Purdy says also that the simplest way to deal with the remnant of personal property, now subject to the general property tax, is to abolish the tax. The loss of the revenue would be more than made good by the increased value of real estate due to the relief from the danger inherent in the system of personal property. Mr. Purdy’s views were quoted also in the American Magazine for December. He is president of the Trinity Alumni Association. 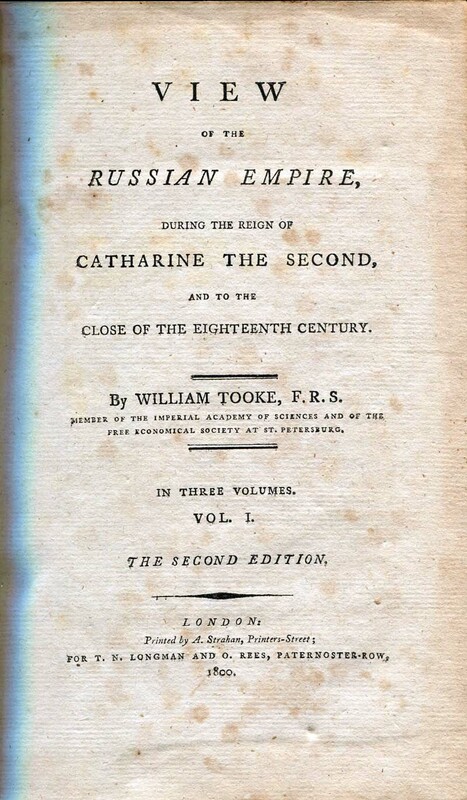 View of the Russian empire during the reign of Catharine the Second, and to the close of the eighteenth century, by William Tooke (1744-1820). (London, 1800). In the bowels of the Watkinson I discovered a printing press. It is tucked into the corner of a former ladies’ bathroom (plumbing removed, pipes stoppered), behind a heavy cabinet full of type, and an old card catalog with glass slides depicting ruins and documents related to ancient Greece (cast-offs from the Classics department). It is a Washington hand press, made by the Hoe company (aside from being an industrialist, Robert Hoe was also a very famous book collector). Samuel Rust first patented the design in 1821 (with an acorn frame), and re-designed it (the way ours looks) in 1829. The Hoe Company bought the patent in 1835. 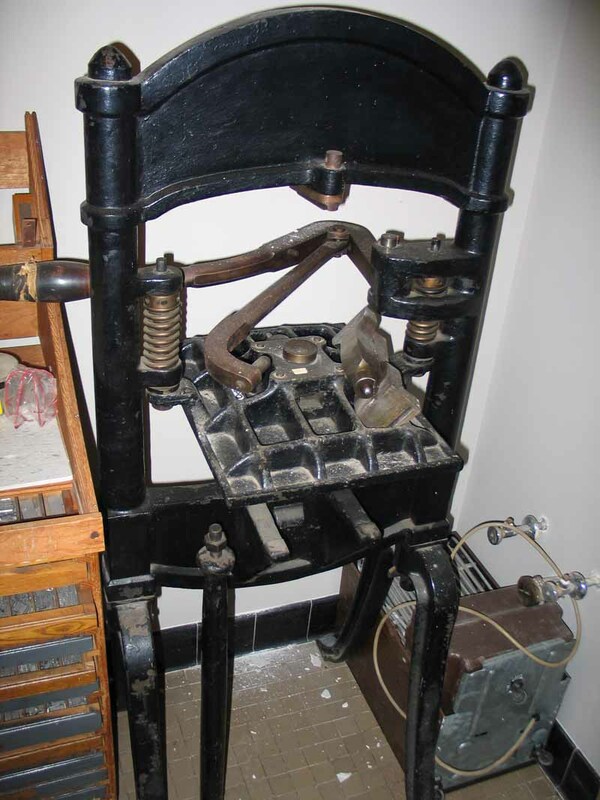 This model was one of the standard pieces of equipment for job-printing from the 1840s-1880s, and many of them, once they were “retired,” made their way into private press shops in the early 20thC. This one was employed by the Cellar Press (Bloomfield, CT) from the 1930s to the 1960s. I say “discovered,” but of course the staff knew it was here. It has been here since the late 1960s, when Mr. Peter Knapp (currently the College Archivist, but back then a reference librarian) had it removed from the Art department, and tried, in his pithy and self-deprecating words, to “mess around with it.” It was donated, as many such presses were (and are), in the hopes that it could still be useful, and not scrapped. I find it heartening that this is happening–that the old technologies are not being cast out of hand (so to speak–if you know the language of printing, this will resonate as a pun). 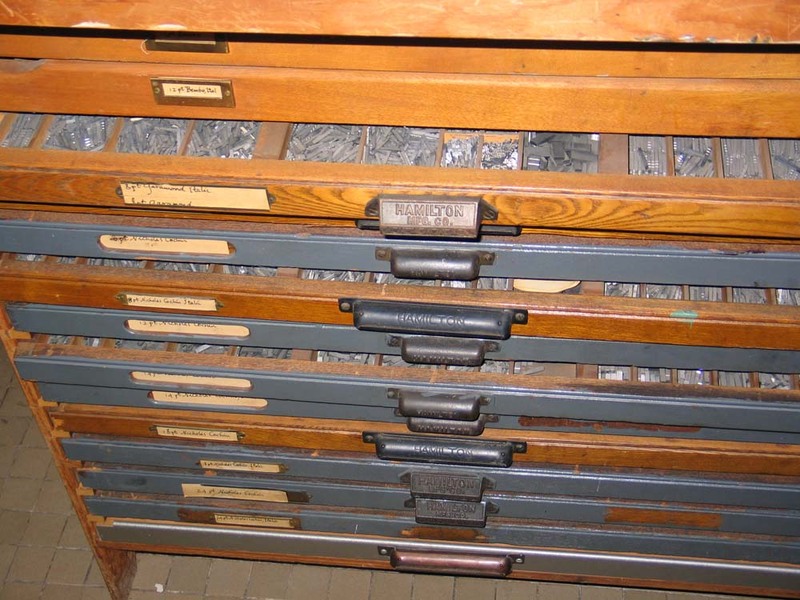 Immediately upon discovering the press and the dozen or so trays of type (mostly Garamond, 10 to 24 pt), I began scheming. That’s what I do. I try to exploit every potential asset that comes into my hand. So here, I thought, is an opportunity. “This manual is intended primarily for users of Washington-style handpresses, although many of the procedures will also be applicable to most other makes of iron handpresses, and some of the procedures will even be helpful for printers using manually operated cylinder presses, such as Vandercook proof presses. I have singled out the Washington-style press because it is the most frequently found hand press in the United States” (Preface). Up to now, I have only studied printing in the abstract–its history, and the basic outlines of its practices during the handpress period (1450-1850). I intend to use this blog to document every stage of my transformation from an ignorant neophyte to a (hopefully) skilled amateur printer. Stay tuned! Comments Off on Move over, Gutenberg! John Josselyn. 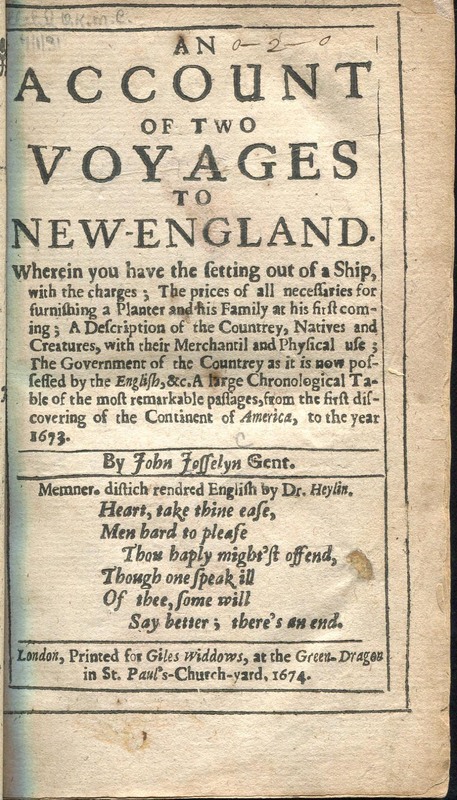 An account of two voyages to New England (London, 1674). “College Trained Journalists” (From the Charleston News and Courier). One or two newspapers have aroused some discussion by asserting that the college-trained men whom they have tried on their staffs have never been even moderately successful, from which it is argued that schools of journalism are worse than useless. There was a time when medical schools were laughed at. It was assumed that young men could only be properly trained in doctor’s offices, whereas, as a matter of fact, these were the very places where they received the poorest kind of training. So also in the legal profession law schools were ridiculed. Medical and law schools are modern things, and it has not been many years since they were objects of suspicion. In fact, only when their early students became the older members of the profession did this suspicion die out. It is manifestly absurd to assume that a man will be ruined for journalism if he is taught journalism as a profession, and it is just as ridiculous to assert that the student will not be greatly benefited by such training, assuming of course that the school which he attends is a food one. In journalism as in anything else some aptitude for the work is required. Some men cannot write and never will know how to write. Others have no power of observation or are woefully deficient in the ability to condense or to separate the wheat from the chaff. One great trouble with journalism today is that there are not enough college -bred men in it. If the press is to influence or make public opinion, evidently the press should itself be controlled by men who have been taught how to think clearly and well, who know the English language, who are acquainted with history and the arts, and who are thoroughly educated in a general way. Yet the greatest journalists will still be born, not made, no matter how many schools of journalism there are. The great mass of workers can be trained for their work, but even training cannot make great journalists. They, like great men in every profession, are born, taking due pains after birth of course to make themselves ready for their life-work. You are currently browsing the The Bibliophile's Lair blog archives for December, 2010.